With its sweeping bowl design and white finish, the Swanston Contour 37 in. 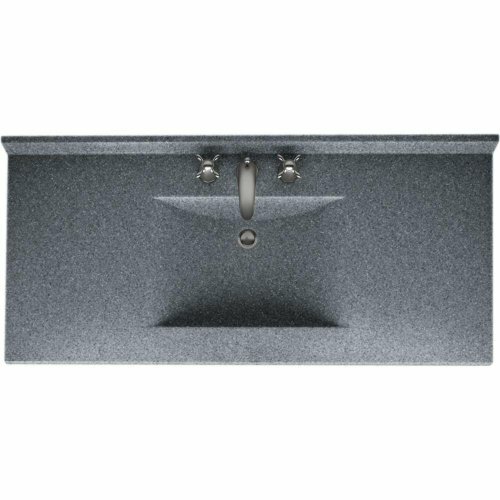 Solid Surface Vanity Top in Gray Granite with Gray Granite Basin offers a contemporary, clean look to help enhance your bathroom. Multiple drill points allow you to install the faucet of your choice (faucet sold separately). Crafted to withstand damage from acetone, hot curling irons, makeup or hair dye, this vanity top ensures easy upkeep and long-lasting enjoyment. The included 3 in. tall backsplash helps prevent water from damaging your wall and vanity back. 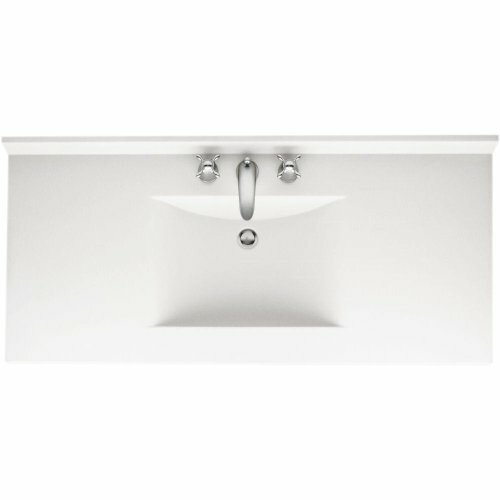 Durable solid surface materials protect the through-body color of this Swanston Contour 31 in. Solid Surface Vanity Top in Tahiti White with Tahiti White Basin from wear, ensuring a stylish, long-lasting accent to your bathroom. The elegant sweeping shape of the integrated 13 in. x 20-1/8 in. x 5-1/2 in. 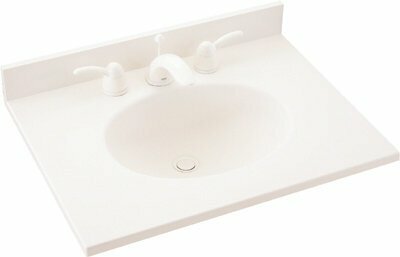 basin complements a variety of decor, aided by a flush, flat edge and seamless integrated 3 in. backsplash. Dekor Sinks and vanity tops are proudly made in the USA. Our solid surfaces are highly resistant to stains, rust, and oxidation and are easy to clean with any non-abrasive cleaning products. The Swanston Contour 43 in. 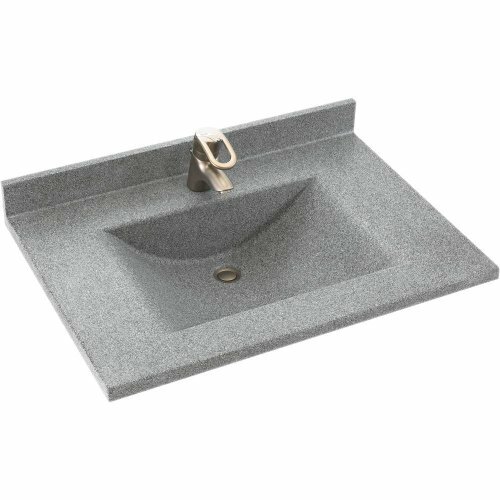 Solid Surface Vanity Top in Gray Granite with Gray Granite Basin adds a beautiful accent to your bathroom, giving it a fresh new appearance. This vanity top features a tall backsplash to help prevent water damage to your wall and vanity back, as well as to provide a finishing touch to your vanity. Multiple drill points allow you a choice of faucet styles to accommodate your design aesthetics (faucet sold separately). Crafted to withstand damage from acetone, hot curling irons, makeup or hair dye, the vanity top ensures easy upkeep and long-lasting enjoyment. The Swanston Contour 49 in. 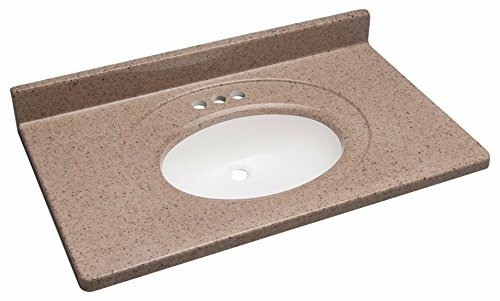 Solid Surface Vanity Top in Gray Granite with Gray Granite Basin features a sweeping bowl design to help add a contemporary look to your bathroom. The vanity top resists damage caused by acetone, hot curling irons, makeup or hair dye to help ensure long-lasting use and easy upkeep. Multiple drill points can accommodate the faucet style of your choice (faucet sold separately) and the included backsplash provides a finished look while protecting the vanity back and wall from water damage. The Swanston Contour 49 in. Solid Surface Vanity Top in Night Sky with Night Sky Basin features a sweeping bowl design to help add a contemporary look to your bathroom. The vanity top resists damage caused by acetone, hot curling irons, makeup or hair dye to help ensure long-lasting use and easy upkeep. Multiple drill points can accommodate the faucet style of your choice (faucet sold separately) and the included backsplash provides a finished look while protecting the vanity back and wall from water damage. Bob helps Steven Nyz install a Surell one-piece vanity top and sink. No screws or nails are used, just some silicone caulk. Surell is totally non-porous, making it easy to clean and maintain. Living stone solid surface vanities in Pebble beach with 2 undermount karran sinks ogee edge and back splashes. This video shows you how to quickly and simply cut holes in a Corian Vanity top for faucet installation. 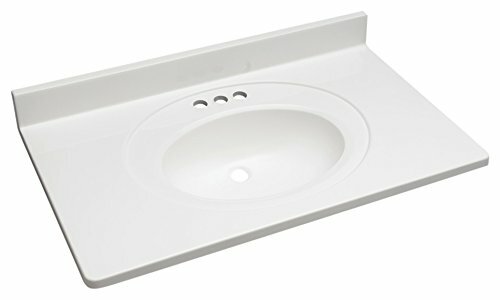 Corian is a soft, but very durable material for vanity tops and counter tops. 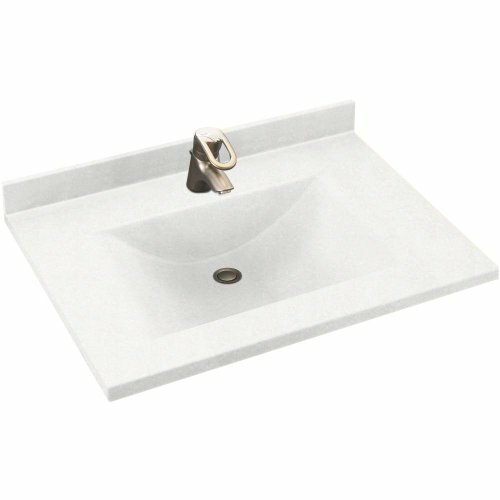 Compare prices on Solid Surface Vanity Top at ShoppinGent.com – use promo codes and coupons for best offers and deals. Start smart buying with ShoppinGent.com right now and choose your golden price on every purchase.